"I am sure the air in heaven must be this wonder working gas of delight". 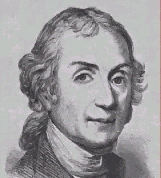 So wrote poet Robert Southey of nitrous oxide, N2O, also known as nitrogen oxide, dinitrogen monoxide, hyponitrous acid anhydride and facticious air. However, its most well known name is 'laughing gas' due to its intoxicating effects when inhaled. After initial trials, Priestley thought that N2O could be used as a preserving agent, but this proved unsuccessful. Following Priestley's discovery, Humphry Davy of the Pneumatic Institute in Bristol, England, experimented with the physiological properties of the gas, such as its effects upon respiration. He even administered the gas to visitors to the institute, and after watching the amusing effects on people who inhaled it, coined the term 'laughing gas'! Davy even noted the anaesthetic effects of the gas: "As nitrous oxide in its extensive operation appears capable of destroying physical pain, it may probably be used with advantage during surgical operations in which no great effusion of blood takes place". However, despite this observation, for the next 40 years or so the primary use of N2O was for recreational enjoyment and public shows. So called nitrous oxide capers took place in travelling medicine shows and carnivals, where the public would pay a small price to inhale a minute's worth of the gas. People would laugh and act silly until the effect of the drug came to its abrupt end, when they would stand about in confusion. Many famous people (of their time) and dignitaries from Clifton and Bristol came to inhale Davy's purified nitrous oxide for recreational purposes. Nitrous oxide found a more scientific use as an anesthetic in clinical dentistry and medicine in the early 1840s. The story goes that at that time, a medical school dropout called Gardner Quincy Colton went around the country putting on nitrous oxide exhibitions. In 1844 he happened to put on a demonstration in Hartford, Connecticut, and in the audience that day was a local dentist named Horace Wells. Dr. Wells watched with interest as one of the volunteers, a man named Samuel Cooley, inhaled the gas, and, while still under the effects of the N2O, injured his leg when he staggered into some nearby benches. When he went back to his seat next to Dr. Wells, Cooley appeared to be unaware of the injury until the effects of the gas wore off. Dr. Wells immediately realised that N2O might possess painkilling qualities, and so after the demonstration, Wells approached Colton and invited him to participate in an experiment the next day. Colton agreed, administered nitrous oxide to Dr. Wells while another local dentist extracted one of Wells' molars. Dr. Wells experienced no pain during the procedure, and the birth of N2O as a dental and medical painkiller had arrived. 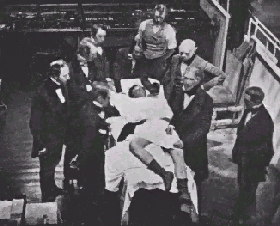 Early surgical operations, such as this one from 1850, used ether as an anesthetic. This was dangerous, because ether is highly explosive. So a new anesthetic was needed that was not so dangerous to use. The story does not end happily, however. In January 1845, Dr. Wells demonstrated his discovery of the effects of nitrous oxide at the Harvard Medical School in Boston. A patient was anesthetised and a tooth was extracted, but during the demonstration the patient complained that he felt some discomfort. Even though the experiment had been successful (in that the patient had only felt slight discomfort and not excruciating pain), the suspicious audience were unhappy, and booed Wells from the stage. This public humiliation eventually led to Dr. Wells losing his reputation as a profession dentist, and finally to his suicide three years later. Ironically, 150 years after his premature death, his discovery would be adopted by dental practices worldwide, and Wells would be given the accolade - the "Discoverer of Anesthesia". Nitrous oxide is a very safe and popular agent still utilized by dentists today. It is much less toxic than alternatives, such as chloroform, with far less risk of explosion than ether. The main use for N2O is usually as a mild sedative and analgesic. It helps to allay anxiety that many patients may have toward dental treatment, and it offers some degree of painkilling ability. At room temperature, N2O is quite unreactive with most substances, including alkali metals, halogens, and even ozone. It is therefore widely used as a propellant in aerosol cans in place of the CFCs which can damage the ozone layer. When heated sufficiently, however, N2O decomposes exothermically to N2 and O2. If this reaction occurs in the combustion chamber of an automobile, 3 moles of gas would be produced from 2 moles, providing an extra boost to the piston, as well as liberating more heat. It also has a number of other benefits. The increased oxygen provides more efficient combustion of fuel, the nitrogen buffers the increased cylinder pressure controlling the combustion, and the latent heat of vaporisation of the N2O reduces the intake temperature. Therefore N2O is occasionally injected into the fuel lines of racing cars to give more power to the engine and to give the car exceptional acceleration. Some details on how this works can be found here. I.E. Eger, Nitrous Oxide (New York, Edward Arnold Ltd, 1985).